At last night’s orchestral rehearsal I spoke with Michael Devlin, who plays a small but significant role in Attila: Leone, the religious leader who single-handedly (well, assisted by the power of God) repels Attila and saves Italy from the Hun’s ravaging hordes in the great climax to Act One. This production marks a return of sorts for Devlin, who has the unusual record of singing one opera with Seattle Opera in each of the past four decades! We talked about some memorable productions from long ago, about how to make a big impression in a small role, and the power of Verdi’s glorious music. Welcome back to Seattle Opera! Can you tell us about your early history with the company? I first came here, my first time in the city and with Seattle Opera, to cover the great Norman Treigle in Boito’s Mefistofele in 1974. 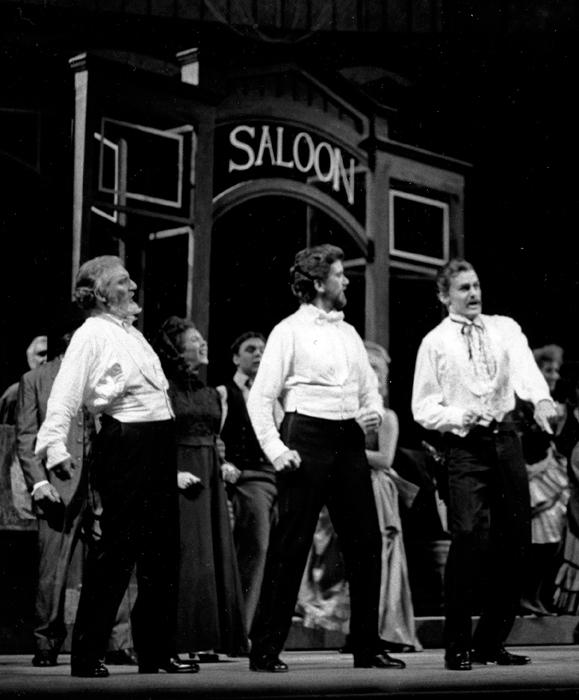 That’s right, that was a production originally from New York City Opera, Speight Jenkins once told me it was one of the most exciting nights of theater he could remember. One of those productions where, years later, he remembered every single thing that happened in that show. Yes, and Treigle was doing it all over the country. In Seattle I was supposed to do one performance, but he got a cold, so I stepped in for a second performance. I fell in love with the city—it’s just a wonderful place. I moved here in 1980, and have lived here ever since. 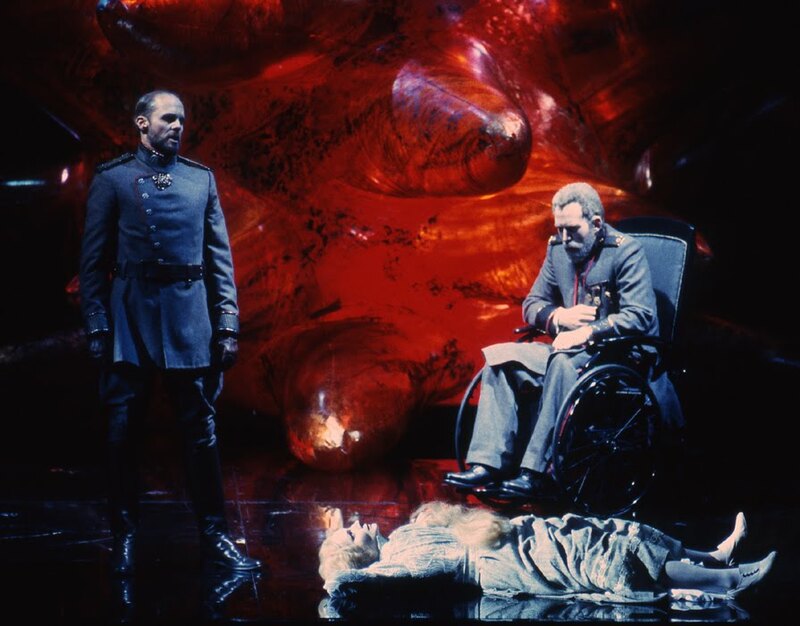 I sang my one Horace Tabor in The Ballad of Baby Doe the first season that Speight took over , and then I sang Golaud in the famous Pelléas et Mélisande designed by Dale Chihuly in 1993. I’ve also sung many times with Seattle Symphony. But this is my first time singing in McCaw Hall. From the stage you can hear more sound coming back. You know, when a singer gets on the stage, and sings forte, you can feel the sound coming back. But here it sounds better to me than it did in the old theater for the Pelléas. The architects and acousticians did a great job! I’ve heard a number of singers say that—that it’s reassuring to hear yourself, your own voice coming back at you the way it does in McCaw Hall. Oh, yes. You don’t ever want to feel like you’re just singing into a carpet, that’s the worst feeling in the world. Because that encourages you to push harder. You mustn’t do that because that distorts the voice. 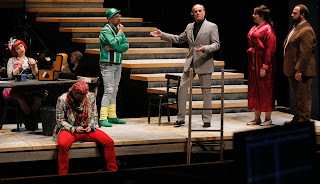 So the Seattle audience has only ever heard you in really unusual roles: Mefistofele, Horace Tabor, Golaud, the Haushofmeister in our YAP Ariadne at Meydenbauer a couple of years ago. Do you ever sing any repertory that isn’t so offbeat? Hey, I sing whatever they pay me to sing. If I can sing the low notes and the high notes, and what’s in the middle, I’ll do it! I’m a bass-baritone, basically, but I’ve done some Verdi baritones, Amonasro, Germont, things like that. And some bass roles. In San Francisco, I once did the Rheingold Wotan down there, and Gunther in Götterdämmerung, covered Alberich in Chicago. Wagner is so loud, and long! I was more comfortable with Mozart, early Verdi, and with French rep. 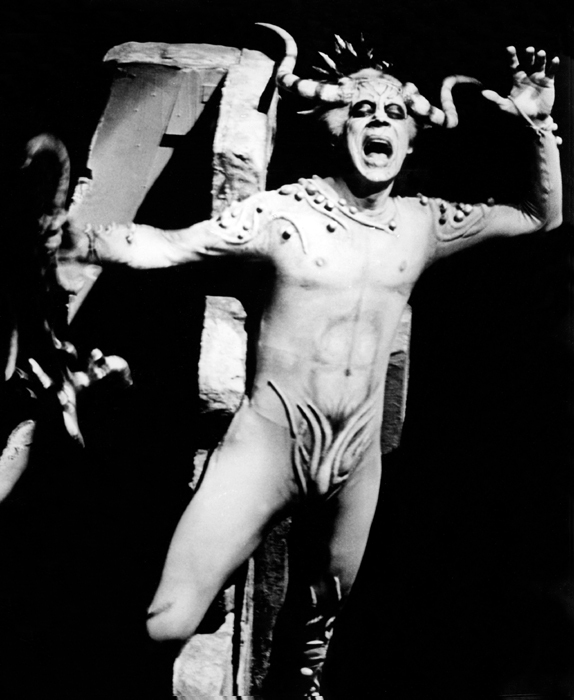 I loved doing Tales of Hoffmann. And I sang a lot of Figaros and Counts and Don Giovannis. And not only have you never done Attila before, you said you’d never even heard it before! Not completely, before I started rehearsals for this production! What other early Verdi operas have you sung? I did some concert performances of Alzira. Really? Wow, that’s even more obscure than Attila. That was one of my first Carnegie Hall roles, in New York back in the ‘60s. 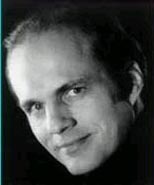 Jonel Perlea was the conductor, it was one of his last jobs: he was partially paralyzed at the time, but he managed to conduct Alzira. He conducted the recording of Aida I grew up with: Milanov, Tucker, Boris Christoff as Ramfis—great recording. But getting back to Attila (what is it with Verdi, all these operas that begin with the letter ‘A’), your character, Leone, only sings one line. How do you make an impression with such a small role? That’s really up to our wonderful director, Bernard Uzan. He’s staged me coming right down the middle of the stage, with a follow-spot, and a snow-white costume in the middle of everybody else with dark brown and black costumes. Do you have a long white beard, too? I don’t think so, although we don’t do it with make-up and lights until tomorrow. I do have a nice shiny bald head, as you can see. I hope it’ll make a strong, if brief, impression. Have you ever had such a short part? When I was first starting out, sure, there’s lots of little bit parts where you come out and sing your one line! But this is interesting, my solo here lasts exactly 33 seconds, I timed it. And to make a good impression in 33 seconds, about all you can do is stand tall and sing as loud as you can. 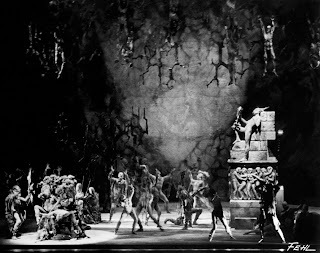 The character of Leone, mysterious bass whose voice seems to have this supernatural power to defeat evil, reminds me of the Frate, the eerie Monk from Verdi’s much later opera Don Carlo. I did sing the Monk once. Yes, it’s the same kind of thing, the same kind of small role that makes a big impression. Neither character sings much by way of melody. It’s all monotone, isn’t it? Any time Verdi wrote a nice short part like this, where you come in and declaim your big line, it’s usually on a middle C or middle D, right in the best part of the voice for a baritone. Isn’t that what Monterone does, in Rigoletto? 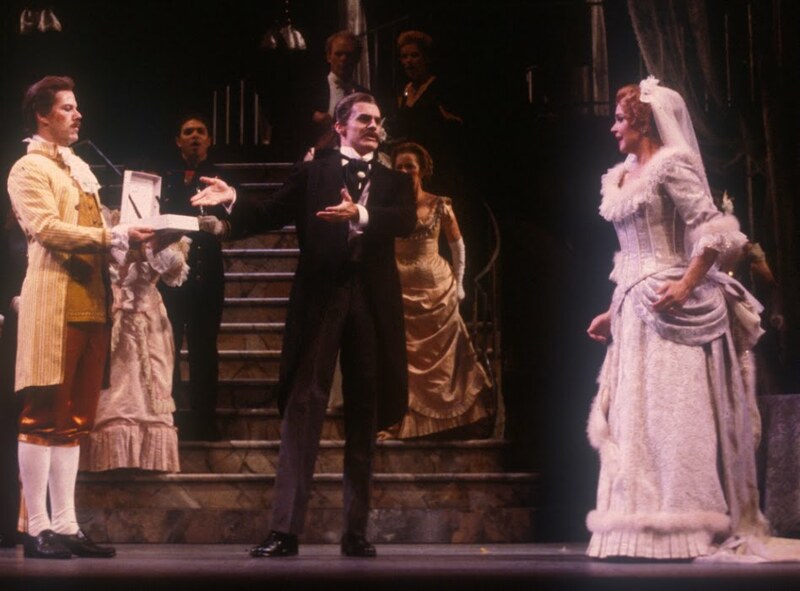 Monterone, yes, as well as the usher who brings him in—that was one of my first roles, about 45 years ago. And the “La cena e pronta” man in La traviata, and the Marquis and the Baron, these characters sing their lines all right around middle C, which is just wonderful. You can be nice and loud! The other thing that’s really odd about the line Leone sings is that it’s a repeat. Yes, Attila sings to Uldino that he had this vision in a dream, who spoke to him, and then I suddenly appear and I look the same and sound the same as the figure in the dream. Maybe if the audience hears it a second time they can hum along! Now Attila is inspired by history, although a) it’s not very good history and b) in our production, the action is contemporary. What can you tell us about the historical background for your character? It’s [Director] Bernard [Uzan]’s idea that it would look a little strange for the pope to come all the way out and speak to a bunch of rebels in the middle of the woods. So we’re telling the story that this is Leo before he became a pope, maybe he’s the head cardinal, or something like that. I was hoping for the little red shoes and the tall pointy hat, but they gave me a long tunic with a white coat over it. I’ll have to wait for the next production to do the red shoes. 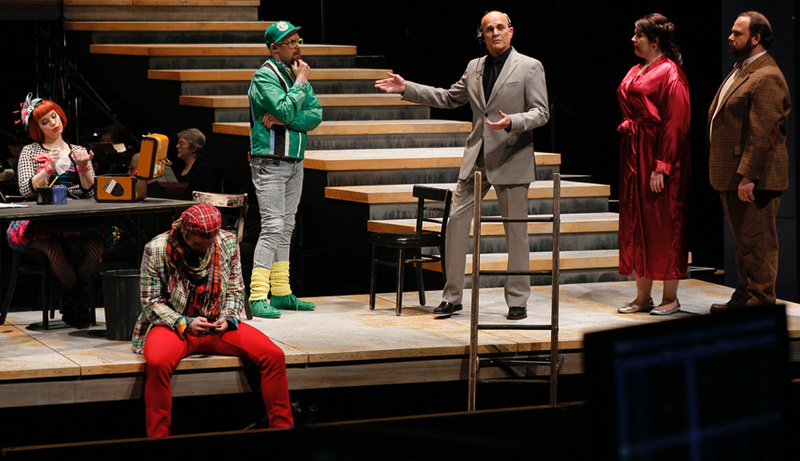 What’s it like to play a Catholic priest in an opera by Italy’s most staunchly anti-clerical composer? It’s true, Verdi had a few run-ins with the church, they made him change his settings, twist the plots around. The church was quite a political force in Italy back then, probably even more so than it is now. You really couldn’t cross ‘em. And he probably did. What’s your favorite thing about singing Verdi? Part of it is listening to what’s going on around me. He’s such a wonderful, wonderful composer for the voice. If you have a Verdi voice, and work on the legato, it’s wonderful: dramatic, but with the chance to sing some beautiful lines. It’s great to hear them, and sometimes to sing them! Michael Devlin as the Haushofmeister, surrounded by the YAP cast of Ariadne auf Naxos: l to r Megan Hart as Zerbinetta, Michael Krzankowski as Harlekin, Alex Mansoori as the Tanzmeister, Marcy Stonikas as Ariadne, and Stephanos Tsirakoglou as the Musik Lehrer (Chris Bennion photo). What’s your favorite thing about singing at Seattle Opera? It’s great to be home. I’ve been doing this for 46 years, going to New York all the time, and to Europe, all the major cities in this country and minor cities too. I’ve been traveling and living in hotels and motels and sublet apartments for 46 years, and, while I’m not tired of singing, I still like to sing, I’m really tired of the traveling. So I said goodbye to New York after this past season at the Met. I’m always happy to sing at home, but the traveling is getting to be a bit much.